If you are one of those people looking at these cookies saying, really? Flowers? I know just what you mean. I used to think the same thing, I thought people were trying too hard to be fancy :). Then one day I tried something with lavender and I’ve been hooked ever since. 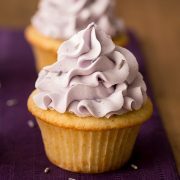 Some days I crave lavender cupcakes, something I never imagined myself craving. 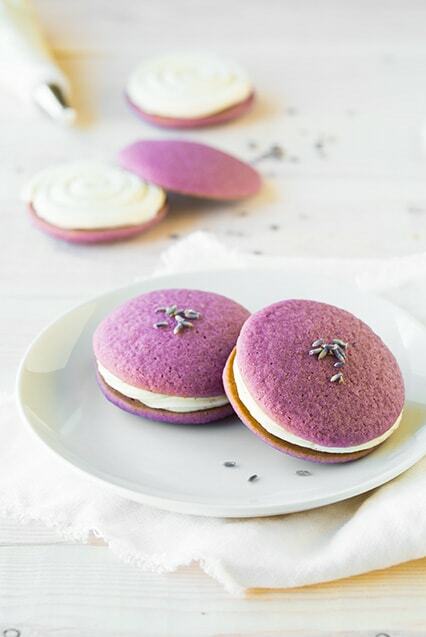 Lavender is a very unique and complex flavor (but unique in a good way). While bold and rather surprising, it seems hard to find a similar flavor to relate it to. It would be almost like what I’d imagine a sweet pine flavor to be, along with hints of mint – but it sounds kind of gross when I put it that way so lets just leave it at the opinion of it being an amazing flavor. I love giving someone something with lavender who hasn’t tried it before, they’ll take one bite and get this look of delight followed by a look of utter confusion and deep thought because they can’t quite put there finger on just what is in it. Yes lavender can really taste good (culinary lavender of course, don’t start baking with your Grandma’s potpourri. :) The key is, when you bake with it just don’t overdo it. My entire family, husband and kids included loved these whoopie pies. My husband just said after taking one bite “Mmmm, I love Lavender” (and it sounded kind of funny coming from a manly man, I don’t know why). Then following he said “get these out of my life” because he claims he can’t stop eating them :). Hopefully you love this recipe because it was my third attempt. First one too dry, and the bit of honey mixed in added a light light tint after baked which I didn’t care for. Second attempt, too spongy and the batter seemed pretty wet to work with. Third attempt, just what I was looking for. First, I tried flour+cornstarch along with all butter and milk. Second more milk, cake flour and used butter and oil. Third attempt added in 2:1 ratio Greek yogurt to milk rather than all milk, went with all-purpose flour, butter and oil and they were just what I was looking for. Fluffy, cake-like and soft, what a whoopie pie should be. I paired it with my favorite buttercream frosting, but since whoopie pies aren’t as moist as cupcakes I added more moisture (milk) into the frosting that could absorb into the cookies. I chose to pair it with vanilla beans which I added to the frosting because I love the combination and how the vanilla doesn’t overpower and hide the lavender (I made a few with lime frosting and preferred the vanilla, but if you wanted to do a lemon or lime frosting just replace the milk with lemon/lime juice and also blend in the zest). Enjoy! 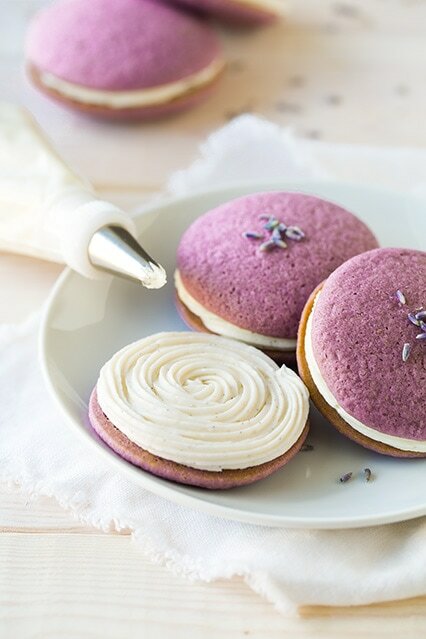 Soft and fluffy lavender flavored cookies filled with a sweet vanilla bean frosting. Preheat oven to 350 degrees. In a food processor or blender, combine greek yogurt, milk, dried lavender and vanilla and blend for 1 minute, scraping down sides and lid of food processor once during blending. Pour mixture through a fine mesh strainer into a bowl while using a spatula to press and rub lavender against strainer to release oils (also scrape out any excess from food processor - get all of it). Set aside and allow to rest. In a mixing bowl, whisk together flour, baking powder, baking soda and salt for 30 seconds. In a separate mixing bowl, using an electric hand mixer whip together butter, oil and sugar on medium-high speed until pale and fluffy, about 2 minutes. Blend in eggs one at a time, adding in food coloring with second egg if using (I used about 30 drops blue and a little less red). Add in flour mixture in three separate batches alternating with half of the milk mixture, beginning and ending with flour mixture and mixing on low-speed just until combined after each addition. Transfer batter into a piping bag fitted with a 1/4-inch or 1/2-inch round tip and pip cookies onto a Silpat or parchment paper lined baking sheet into 1 3/4-inch rounds (I did this by holding the piping tip about 1/2-inch from baking sheet and piping the batter out allowing it to spread outward while slowling moving the piping bag up - similar to piping a meringue cookie without so much tip on top), spacing cookies 2 inches apart. Bake in preheated oven about 6 - 8 minutes. Remove from oven and immediately transfer cookies to a cooling rack. 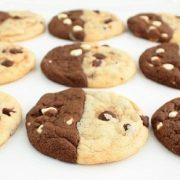 Allow to cool completely then spread Vanilla Bean Frosting on bottom of one cookie and sandwich to bottom of another cookie. Store in an airtight container. In the bowl of an electric stand mixer fitted with the paddle attachment, whip butter and vanilla bean seeds on medium-high speed until nearly white and very fluffy, about 6 - 7 minutes, frequently scrapping down the sides and bottom of the bowl. 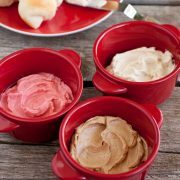 Add in powdered sugar, milk, heavy cream and vanilla extract and mix on low speed until blended, then increase speed to medium and beat until very light and fluffy, about 5 - 6 minutes, frequently scraping down the sides and bottom of the bowl.